This article shows you how to create a shooting canon tower. We'll use the powerfull open source Irrlicht Engine for this task. You are not limited to a canon tower. This also applies e.g. for a player with a weapon. The bullet should fire in the direction the weapon is aiming. Additionally we want to rotate the tower if we press some buttons. We're initializing all important variables for later to get access to the scene manager for adding nodes and so on. Next we're creating a light source and a FPS camera. If we run the project we should see nothing except the background color. You can download the basic 3d model created by me here or create one yourself. I've used my favourite modeling tool Wings3D for this task. To keep the code clean and simple in the course of this article I'll omit the whole error checking parts. You have to place you 3D model next to you source file in this example. // Work out a frame delta time. I use the A, and D key for the rotation of the tower around the y-axis. The attentive readers might have seen that I also implemented a time factor for the rotation that is multiplied with the rotation speed. This technique is known as frame independent movement and can be studied here or here in more detail. The movement is made frame independent by multiplying it with the variable frameDeltaTime. So every second the tower will rotate 20 units. "Cartesian coordinate system handedness". Licensed under CC BY-SA 3.0 via Commons. 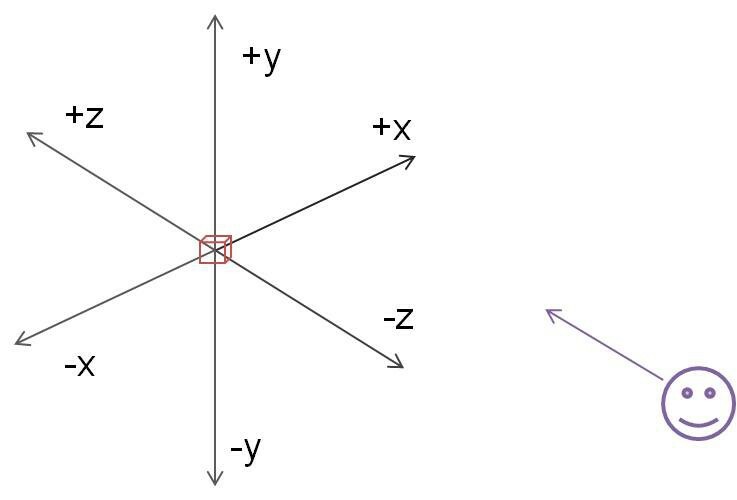 Other than in the figure above in Irrlicht the axis that goes up is the y-axis (perpendicular to the plane that the x, and z axis are spanning). So we have to manipulate the y-axis to rotate the canon tower. 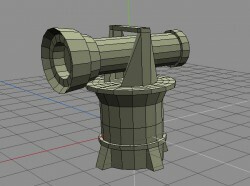 Adding the projectile as child node of the canon tower we can manipulate the projectile as if we are using absolute coordinates because the root/parent and so the point of origin would be the tower and its position. However, we'll use the second approach. 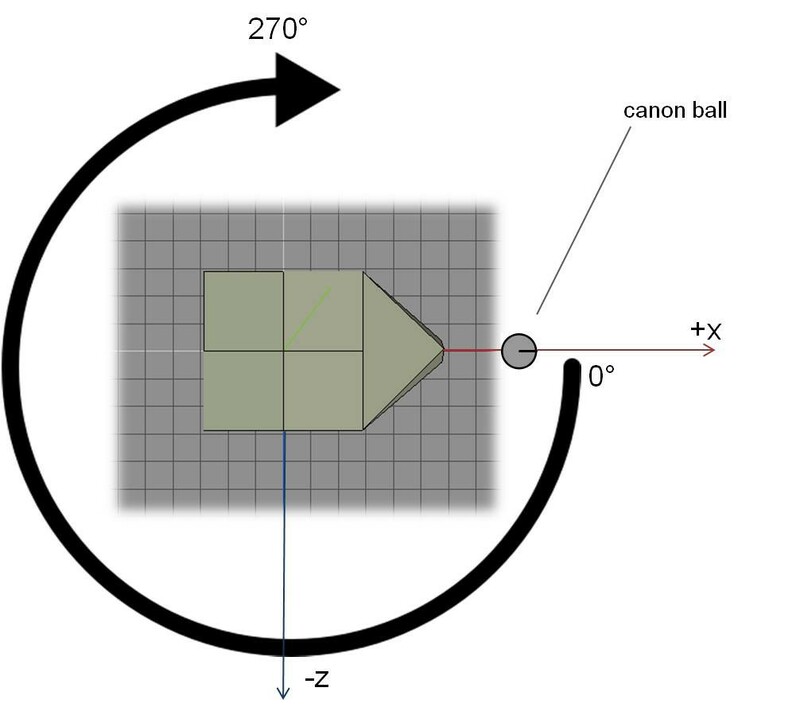 We have to get the absolute coordinates of the canon tower (the world coordinates) and move the canon ball relative from that position. So we can be sure that every time despite the current tower's transformation like scaling or translating (which affecting the position of the tower) the projectile will always be inside in the middle of the tower at the same level as the canon barrel. The next part will be making the canon ball move in the direction the tower is looking. 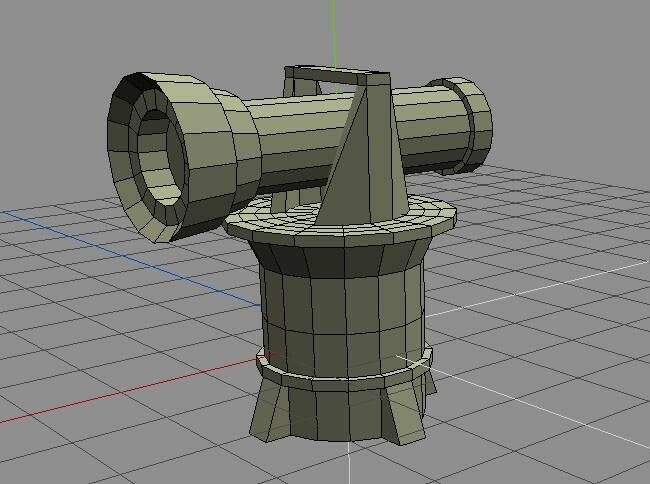 First we need to define the front of our canon tower. Technically speaking there is no real "face" or "front side" of an object. This is important when you generally model your own objects. 3D modelling tools let you sometimes specify the Forward and Up direction of the model when exporting. In Wings3D we have to rotate our model to the desired position. 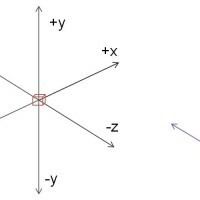 In this tutorial the front is the side which is facing towards the positive x-axis with a rotation angle of 0° of the y-axis. We need this definition later for the actual movement and polar coordinates calculation. It's all a matter of the coordinate system and you have to take this into account when programming. Otherwise the animation would not look right (not shooting out of the barrel in this case) or have to do cumbersome math. The figure below shows the coordinate system of Irrlicht. When a node in Irrlicht is moved towards the screen or camera (in the initial position and rotation) then we have to go in the negative direction, translating it by a negative amount. If we want to translate it to the right we have to add the appropriate amount for the movement to the x-axis. We use this information of the Irrlicht coordinate system for our movement. Remember that Irrlicht has a left-handed one. If we rotate the object by a positive angle value the object would rotate to the left. To make the movement of the projectile in relation to the y rotation angle of the canon tower it's convienent that we use polar coordinates to calculate the position. The right figures shows the top view of the canon tower and the relation of the canon ball to the tower. The position of the projectile depends on the tower's rotation angle. „Ebene polarkoordinaten“ von Honina aus der deutschsprachigen Wikipedia. Lizenziert unter CC BY-SA 3.0 über Wikimedia Commons. The minus in this case is due to the anticlockwise rotation of the left-handed coordinate system. The sin() and cos() functions take radians and Irrlicht gives as the angle in degrees. Therefore a conversion is necessary. Every second the canon ball will be moved by 60 units. One unit in Irrlicht is one meter. Additionally we multiply it with a time factor for frame independent movement as before. By that we can be sure that every second the canon ball will be translated the exact same amount. The bullet is moving as long as the F key is pressed again. Then a new bullet is being shot. if the front of the object was looking towards the negative z-axis. 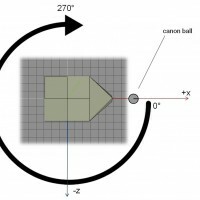 What changes are needed if we want to shoot the canon ball only a certain distance in a certain time?